[October 7, 2013] People make assumptions1 on just about every aspect of their life. It is a simple fact of life that we do not know everything and those knowledge gaps are filled by assumptions. 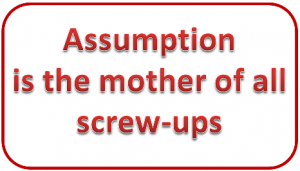 Put another way, assumptions are mental shortcuts that save us time and effort since we don’t check out all the information surrounding the situation. People are able to jump to an answer or solution. Making assumptions is also natural and a human habit. The biggest predicament with making assumptions is that people believe they are the truth. 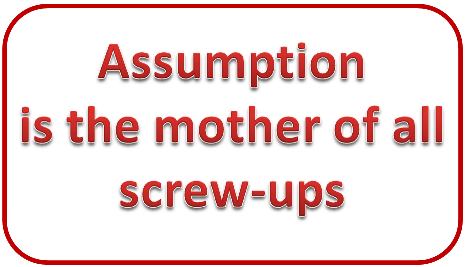 Unfortunately, the problem is that many of the assumptions turn out to be wrong and that can turn out badly if important things ride on those assumptions. Although making assumptions will often help speed things up, it will also unavoidably shield us from other possibilities. Often we will leap to the wrong conclusion and miss the chance to make a better decision. In large organizations everyone makes assumptions that can affect the business in any number of ways; good, bad, or indifferent. When important outcomes are based on assumptions, then that assumption had best be arrived at in a very methodical way. If the hazards associated with that assumption is made clear to everyone and there is a process for verifying the accuracy of that assumption, then the risks are lower if the assumption turns out wrong. Business owners regularly say that they wish they knew what they know now at the start of their business. When asked about this, they regularly say that their biggest mistakes were caused by faulty assumptions. The best advice is to only make an assumption if you have to. Then ensure that it is validated as true as quickly as possible. The problem with this however, is that people make assumptions all the time and are not even aware of it. It takes practice to learn how to recognize assumptions we make. Once we drop our pre-conceived assumptions we’re much more likely to find better solutions in life and in business. As leaders we need to be aware of the problem with assumptions and focus our abilities to preventing assumptions from interrupting our organizations. Assumption: The act of taking for granted, or supposing a thing without proof; supposition; unwarrantable claim.